'Pirouette' shows the value of foliage"
At heart, I am a very bad gardener. I have a horrible attitude towards my precious darlings, my plants, and especially towards my herbaceous perennials. I absolutely refuse to pamper them. I will give them a good start: I try to make sure that the soil is reasonable and weed-free, I mulch them and even occasionally give them a top dressing of manure. After that, they’re on their own. I am quite dispassionate about it. Flourish or die, I say to them. Life is too short to mollycoddle a plant that’s just waiting for the chance to turn up its toes on you anyway. Delphiniums are the exception to my Darwinesque vision of horticulture. As befitting any well-cossetted diva assoluta, they are finickity, fastidious and demanding. For them, I am willing to haul pails of water in the dust of the summer, a Sisyphean task if there ever was one. I will meticulously stake their floppy heads, baby them with extra feed, and generally fuss over them like an elderly, spinsterish aunt with loads of money. The rewards of such effort are glorious. A well-grown planting of deep blue delphiniums, magnificent and suave, has been known to heal quarrelsome marriages and make strong men weep. 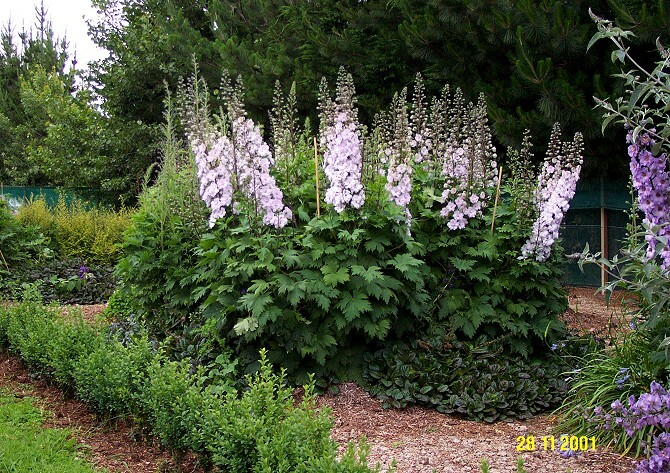 For many years, like nearly everyone else in this country, I have grown the Pacific Giant cultivars. This was for lack of anything else reasonably available. (I won’t speak of the so-called dwarf cultivars, supposedly "suitable for windy and exposed locations", because they are, well, unspeakable.) I raised Pacific Giants with some reluctance, for I have never been completely happy with them. Though performing well enough and occasionally giving exceptional results they never matched the delphiniums that haunted my dreams, the ones that seem to inhabit English gardening books, with strong stems and clear excellent colours. At best, Pacific Giants are short-lived perennials: they have acquired a certain amount of notoriety for being their best the first year after planting, even in Canada where delphs grow strong and bold. (In more effete, southern parts of this continent, they are treated as annuals.) Then after this season of triumph — a slow, sad decline for a couple of years before finally being worthy of the compost pile. This trait is so strong that nearly every gardening reference I have recommends renewing delphiniums regularly. Delphiniums are even getting a reputation for being difficult. It’s a tired rehearsal of an old familiar tune: a once beloved plant going to seed, as it were. If there was ever a plant that needed saving, it was the delphinium. I was happy therefore to come into the acquaintance of Dowdeswell’s Delphiniums ( www.delphinium.co.nz ), a New Zealand nursery which specializes in the production of delphiniums from seed. Situated near the town of Wanganui (which resembles nothing if not a New Zealand version of Niagara-on-the-Lake) on the North Island, this nursery is operated by Janice and Terry Dowdeswell. It is only a very slight exaggeration to say the Dowdeswells may have rescued the delphinium from itself. To begin with, so Janice Dowdeswell tells me, I wasn’t quite imagining the shortfalls of the Pacific Giant strain. Originally bred in the early parts of the 20th century, this F2 hybrid sacrificed colour variety for perenniality. Then indifferent attention to the purity of the parent stock led to a general decay in the vigour of the strain. "Breed nothin’ to nothin’ and you get nothin’," is the old aphorism of stable-owners everywhere, and it seems to apply equally as well to delphiniums as to horses. I note, however, several seed companies are now offering reselected versions of the old standard. Terry Dowdeswell is cool towards the reselected strain, the nursery having given them a test. "Reselected, but not improved," he says, not impressed. "Just as bad as the old stuff." The Dowdeswell nursery originally began in 1978 as an outfit supplying chrysanthemums for the cutflower trade. Then in one of those happy circumstances that seem dire at the time, the Dowdeswells developed an allergy to chrysanthemum pollen, and had to switch crops. 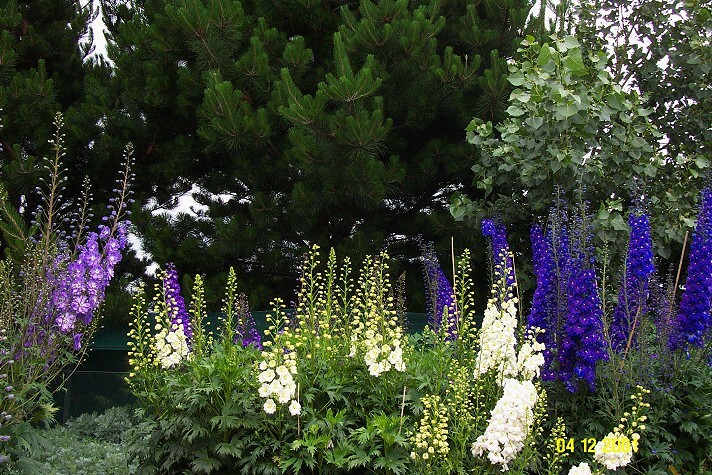 "No one was producing cut flower delphiniums locally so we decided to give them a go," says Janice Dowdeswell. Being dissatisfied with the omnipresent Pacific Giant cultivars led the Dowdeswells to start to breed their own seed for cutflowers, using stock based on English delphinium types. Soon enough, they found a large demand for plants and seed of their stock and by the mid-nineties were offering both of these on a commercial basis. What the Dowdeswells had in fact created was a different strain of F1 hybrids, one they soon named ‘New Millennium’. The combination of rigorous selection and hand pollination, strong parentage and F1 hybrid vigour has made for a strain which is remarkable in its range of colour and singular beauty of form. Like all English delphiniums, from which the ‘New Millennium’ strain is descended, the individual flowers contain a minimum of thirteen petals — technically sepals — up to forty or more surrounding a central "bee" of a self or contrasting colour. (For you botany weenies like myself, interested in plant anatomy, it’s the "bee" itself which contains the petals.) 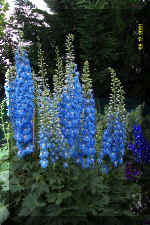 Hence, delphiniums might have blue on blue or black or white on blue and so on through shades of pink, purple and white. Dowdeswell’s Delphiniums offers for sale 24 unique, hand-pollinated seedlines of the ‘New Millennium’ strain that cover nearly all these possibilities. Most of these are spectacular, beautiful plants. For example, #25 features "Tall light and dark pinks with a brown bee", which is a considerable understatement, for the colours are clear and the effect of the brown bee gives a plant of notable charm. I am myself partial to #2 "Deep Blues with a probable black/brown/yellow bee (4-6 feet)". Likewise the colour is true and strong, a tremendous asset in the harsh sunlight of a Canadian summer. Being a small business has meant a good deal of flexibility in breeding, so the Dowdeswells have been able to focus on the more unusual characteristics in their selections, such as picoteed edges, less prominent "hooks" — the "spurs" — at the back of the flowers and wiry stems, all features suitable for cutflowers. To be sure, in this regard the flowers will not disappoint. Even the foliage of the ‘New Millennium’ strain is strong, lush and healthy, and provides a perfect foil to the flowers. With their spindly, sparse foliage, the Pacific Giant strain are mops on broomsticks in comparison. Janice is quite frank about selecting for climate: "The main distinguishing characteristic is that we have selected plants that do well in warm conditions and high humidity," she says, just about summing up the present weather in Wanganui, New Zealand. But then, how else would you describe southern Ontario and Quebec around the August long weekend? Resistance to that concomitant of high humidity, powdery mildew, is also a factor in selection, again a trait which ought to be a boon to us in those parts of the country where the summers make your shirt stick to your skin. As for that burning question in the back of every Canadian gardener’s mind — what about hardiness? — the ‘New Millennium’ strain is good to -40C. Even gardeners in Edmonton and Prince Albert should be happy. With adequate snow cover, even this slight limitation is negligible. It is an encomium, perhaps, to the attributes of this strain that Thompson and Morgan, the English seed house, has listed three of Dowdeswell’s seedlines in its current catalogue, and describes the originators of the seed as a "distinguished New Zealand delphinium breeder." When asked about this, Janice would only give a laconic reply: "Yep, that’s us." Underneath this terse reply, I know there is a sense of pride that hard work and dedication have created something gracious, lovely and worthwhile. 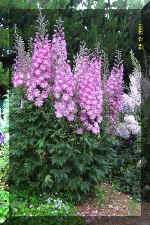 Dowdeswell’s Delphiniums are available to Canadian gardeners through their website at www.delphinium.co.nz. 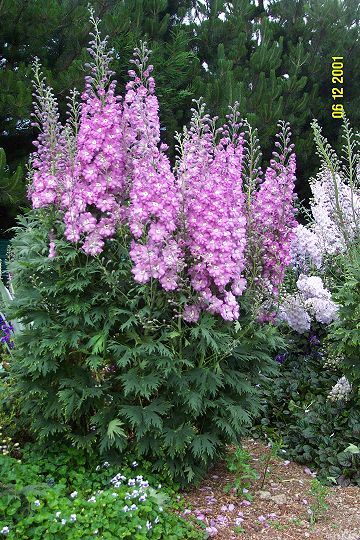 They offer 24 hand-pollinated seedlines, 5 mixes of hand-pollinated seed, 4 open pollinated seedlines, 1 mix of open-pollinated seed and 1 species, Delphinium belladonna. All prices are in NZ$, which is worth about C$0.68. Photographs are used with the kind permission of Dowdeswell’s Delphiniums. Michael Paetzold stakes his delphiniums near the village of Norwood, Ontario.